Model EX-1099SF Production Kiln — Amaco's Model EX-1099 is designed for production, with a giant 9.9 cubic feet of interior volume in a giant firing chamber that is 28" in diameter and 27" deep. A true Cone 10 kiln, it must be wired directly by an electrician with a high amperage circuit and heavy gauge wiring. Use only the full 1 inch shelves for Cone 10 firing. An EZ-Lift™ lid, as well as a Select Fire™ Controller, is included. External dimensions are 38"W × 33"D × 43"H, including the width of the control box and the height of the 8" steel stand that is included. The kiln weighs 290 lbs, and shipping weight is 410 lbs. 2 year warranty. Model EX-365SF — This Cone 10 kiln with a firing chamber that measures 22¾" in diameter and 27" deep has the volume to handle large batches of tile or stoneware. Amaco's Select Fire™ Controller is included, and an EZ-Lift™ lid can be ordered with the kiln, or added on later as an option. External dimensions are 35"W × 28½"D × 42¾"H, including the width of the control box and the height of the 8" steel stand that is included. The kiln weighs 215 lbs, and shipping weight is 242 lbs, or 320 lbs with EZ-Lift. 2 year warranty. Model EX-270SF — This Cone 6 kiln with a firing chamber that measures 23.375" in diameter and 27" deep has the volume to handle large batches of tile or stoneware. 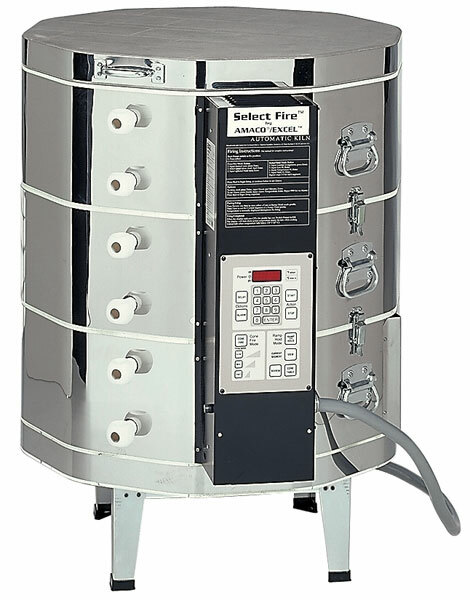 Amaco's Select Fire™ Controller, and an EZ-Lift™ lid can be ordered with the kiln, or added on later as an option. External dimensions are 35"W × 28½"D × 42¾"H, including the width of the control box and the height of the 8" steel stand that is included. The kiln weighs 187 lbs, and shipping weight is 214 lbs, or 290 lbs with EZ-Lift. 2 year warranty. Model EX-1266SF — This model features 6.6 cubic feet of interior volume in a firing chamber that is 28" in diameter and 17¾" deep. These kilns fire to Cone 10. An EZ-Lift™ lid, as well as a Select Fire™ Controller, is included. External dimensions are 38"W × 33"D × 34"H. The kiln has a shipping weight of 330 lbs. 2 year warranty. Model EX-399SF — This model has a 9.92 cubic foot firing chamber that is 28" in diameter and 27" deep. The 240V single or three phase kiln fires to Cone 8. The 208V three phase kiln fires to Cone 8, while the single phase 208V kiln fires to Cone 5. External dimensions are 38"W × 33"D × 43"H. This model has a shipping weight of 400 lbs. 2 year warranty. Select Fire™, the most advanced kiln control system ever, is now available built-in with Amaco's Excel Kilns. Whether you are an advanced artist, production potter, or hobbyist, the Select Fire system means more precise control, greater consistency, and less time spent monitoring firings. Set the kiln to fire by temperature or by cone number (it automatically converts one to the other) at one of three pre-set firing programs — slow, medium, or fast. Use ramp/hold programming to create your own firing profile by selecting up to six segments of temperature change, and hold and store it for your next firing. A digital readout displays Fahrenheit, centigrade and program currently in use. Automatic delay firing will start up to 99 hours, 99 minutes later. Thermocouple, type K included.